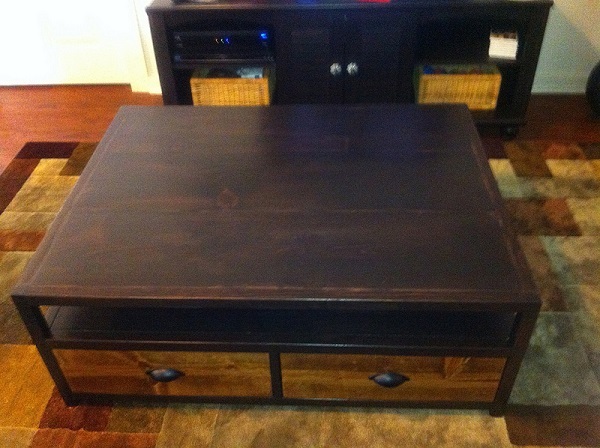 The first blog post I ever wrote was a plan for building our Pottery Barn inspired coffee table. To this day that has been one of my most popular posts! But I've learned a lot since I drew up those plans. I know better building techniques and I'm better at drawing with Sketchup. 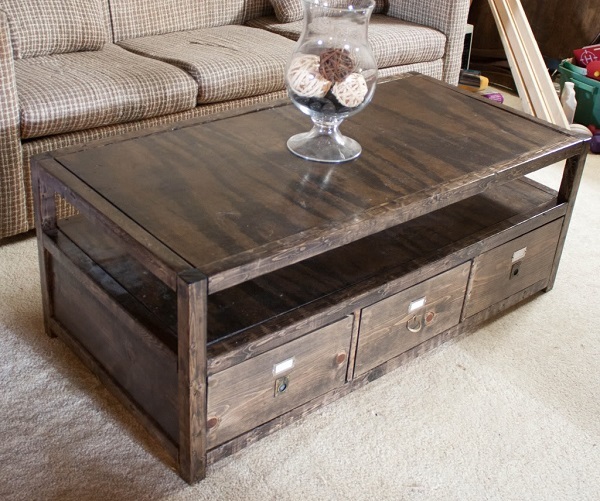 And that's why today's post is an updated plan for my favorite coffee table! The original cost $700 (it's no longer available) but my husband and I built this table out of pine for about $60, not including hardware. That was a $640 savings! **This was the cost when we built our table almost 7 years ago. 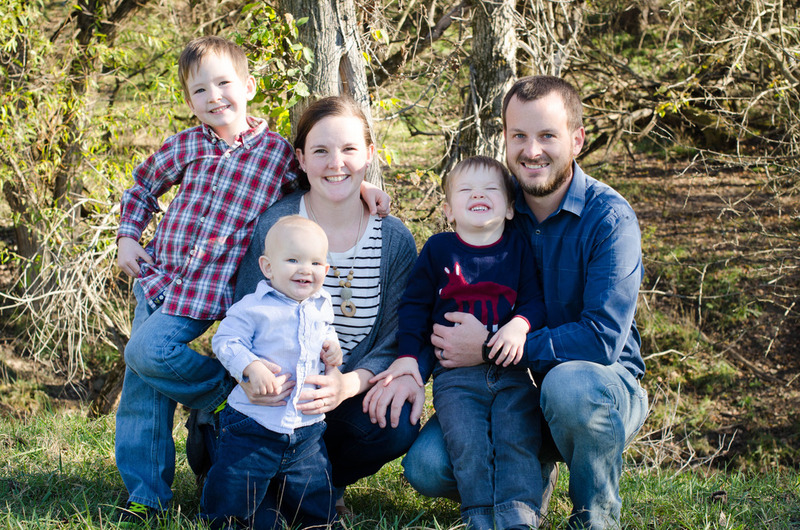 ** And we could not be happier with how it turned out! Want to save that money yourself? Give these plans a try! 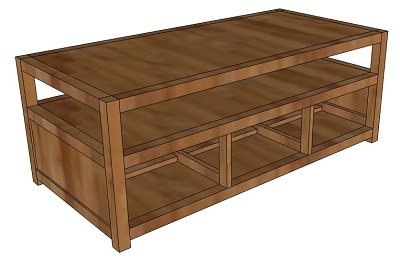 You can also see my original coffee table plans here, my matching end table plans here, and my matching console here. Now, down to business! 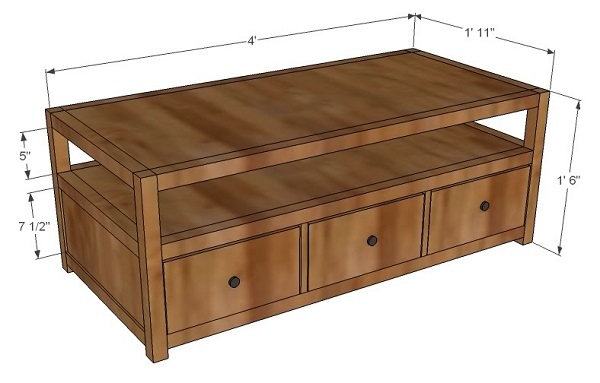 These plans are actually slightly different from the dimensions of the inspiration table and the table I built, but they use standard lumber sizes. I could have saved myself a lot of headaches if I’d thought all that through before I started. Oops. :) But don’t worry, I’ve corrected the plans to make it easier for you! 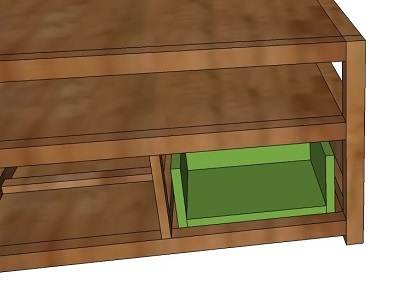 I also drew this version to accommodate drawer slides (the table I built doesn't have them and works fine, but it would be really nice to have them). Please read all the directions before beginning, and cut your pieces as you go, measuring before each cut. Use 2” screws or pocket holes with 1 1/4" screws unless otherwise indicated. Always use glue. Pre-drill and countersink your screws. Home Improvement stores will generally cut your plywood for you. Ask them to cut your shelves to size to save you some trouble. I have not built from these exact plans, so use measure lots to make sure things work out! And don’t forget to check out Knock-Off Wood for more tips! Step 1: Start by assembling the short ends of the table. Step 2: Connect the short ends. Step 3: Attach the stiles. 4. Attach the top rails. You could also use small L brackets like these placed around the edges instead of wood strips: Set the bottom shelf (G) in place. You can attach it with glue and screws or finishing nails, but mine is just sitting in there. Note: this was the tecnhique I used when building my table, but if I did it again I would skip these supports and use my kreg jig to attach the shelf to the rails with 1 1/4" Kreg screws. 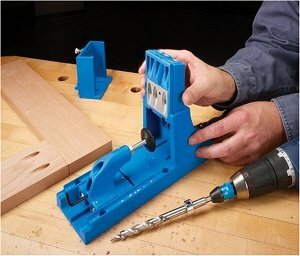 However, if you don't have a Kreg jig this will do the trick! Also, if you are planning to use drawer slides I don't think you would even need the bottom shelf! 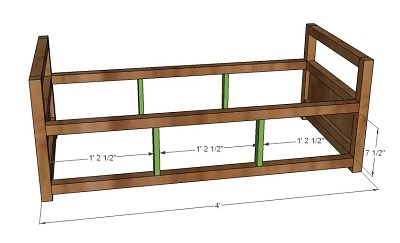 Then attach the center dividers (I) to the bottom shelf as shown below . 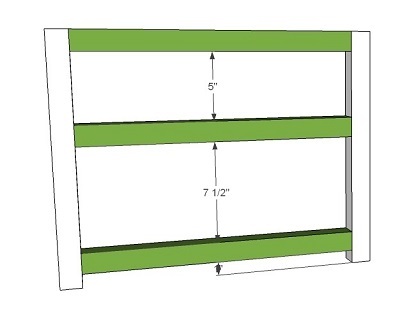 The dividers should be centered between the front & back of the shelf. Note: This is to keep the drawers from sliding all the way through on my table which doesn't have drawer slides. If you are using drawer slides, you may not need these either. And set the top shelf in place and secure it as desired (again, mine is just sitting in there). Now your basic table is complete! Now install your drawer slides (before attaching the drawer front). 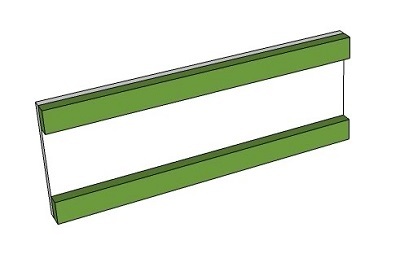 This drawer is designed for a standard slide requiring 1/2″ clearance on each side of the drawer. Adjust so that there is an even fit around the drawers and the drawers slide smooth. Note: if you want more room to work you could assemble the drawers and fit the slides before installing the second and third shelves. 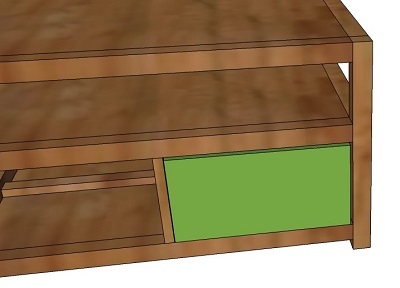 While the drawer box is in place, fit the drawer front (K) onto the front of the drawer box. Wiggle it around to get the front centered with an equal gap on all sides, then attach the front to the box using glue and finishing nails. Note: trace the box on the front with a pencil so you have an idea of where you will need to nail. Step 11: Fill holes, sand and finish as desired. I went with a dark espresso stain on my table. But a bright coat of paint would be beautiful too! Maybe teal or yellow? 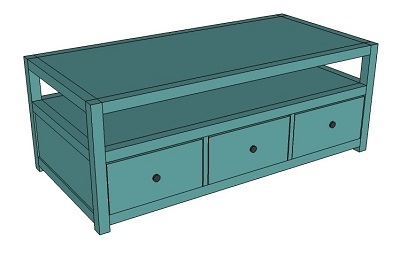 Step 12: Attach hardware to the drawers and you are done! To get the same look as the inspiration table we ordered recessed ring pull hardware like this and used some matching label holders. We got both in brass and antiqued them ourselves, but now they have other colors to choose from (and also some neat square pulls!). The beauty part of home-built furniture is that you have no limitations! Make it your way and make it beautiful! I hope you enjoy my updated plans. Let me know if you give it a try! **UPDATES: I have been put to shame. Check out some of the beautiful work you guys have been doing at home! 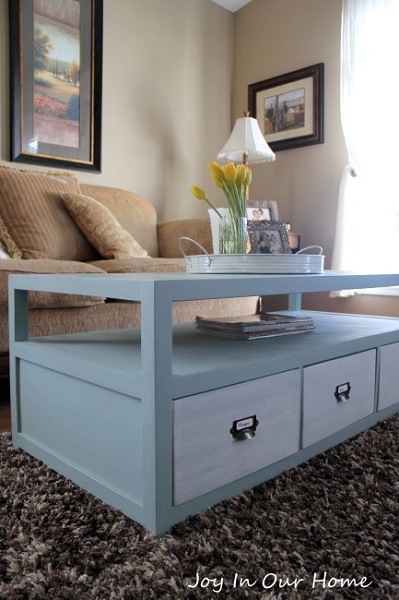 This table with a beautiful blue finish was built by Joy in Our Home. Check out her blog for more pictures and details! Austin built a table from the plans and it turned out AMAZING! Love the cup handles and the rich color. And the corners look so perfect and tidy! (You can check out his pictures here.) Thanks for sharing! 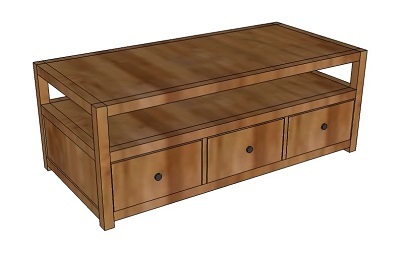 Tyson Chenier made some adjustments to the original plans, adding another drawer under the tabletop. See more pictures here. Thanks for sharing! 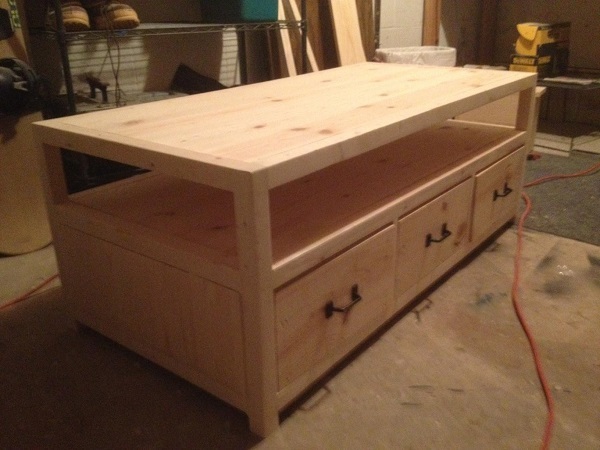 Reddit user mnewhouse12 submitted his nearly-completed project to r/somethingimade. And one more! Paul changed the dimensions to make a sweet square table, put two wider drawers on one side instead of three, and used a two tone finish! It turned out great! Thanks for sharing, Paul! 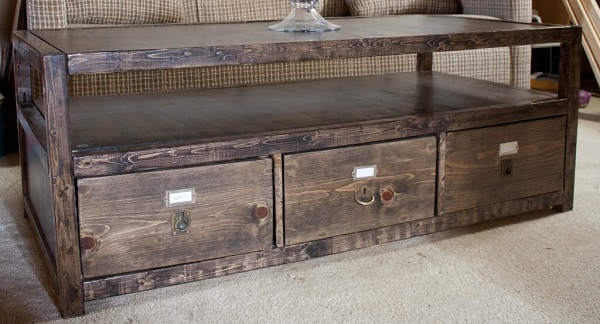 Congratulations on creating one of the most popular pieces of furniture on Pinterest. I hope people post here if they make one! Thanks. :) That would be great! I'd love to see them! 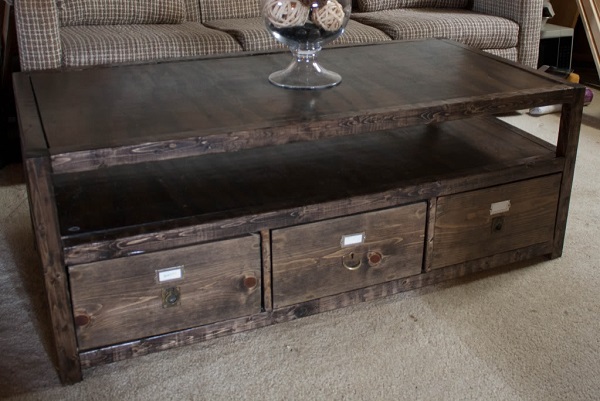 We have a couple of these tables from the collection and my wife would like me to build the side tables. Your plans look great! Thank you for drawing these up and posting them. I have one quick question, how do you get the small 1/16th to 1/8th gaps between the legs and side rails? I'm hoping my knock off side tables look as close to the originals as possible. Thanks again. Sorry Dave, I'm not totally sure what you're looking at! I don't have any gap between the legs and side rails. Do you mean the originals have gaps there? Great plan! You mention using a dark expresso stain, but so many brands turn out different. I love the way your project turned out! What brand of stain and specific color name did you use? I ordered it online because I couldn't find it locally. To get the same finish as me, you'll have to apply it a little different than the directions say to make sure the grain shows up nicely. The way I did it was that I didn't let the stain soak in AT ALL. I dipped a rag into the stain, and rubbed it into the wood pretty fast so that it only picked up a little of the color. There wasn't any brushing it on or letting it sit. Just rubbing it on as fast as I could go, making sure not to leave any kind of puddles. Hope this helps! Well thank you very much! I just moved it into my new apartment and it looks awesome in there! The stain that i used was called red mahogany and that would be just fine if you posted the picture! Thank you so much for the plan. Just updated the post to include your pic. Thanks again! Great plan! I've been working on it, and was hoping I could ask for some advice - I'm in the final step of applying the wood finish (I've used a dark espresso stain), but there are still a lot of little splinters coming off of the plywood top. Is there anything I can do without having to re-sand, re-stain, and refinish everything? Hmmm... I don't really know, I'm sorry to say. I might try lightly sanding the rough areas and just touching up the stain in those spots, but I can't guarantee that would work. :-/ If you want to ask some people with more experience than me I would recommend the forum on Ana's website: http://ana-white.com/community/building-support-and-help/finishing-support-and-advice?sort=asc&order=Replies. Hopefully someone there would be able to help! This is an awesome table! 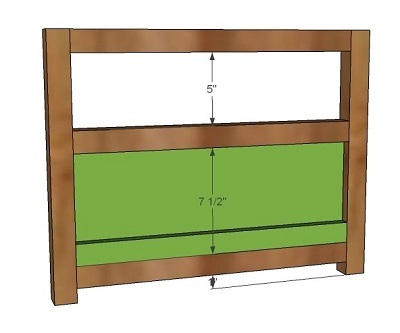 I'm about to do my first woodworking project and want this one to be the 2nd. Had a question: what kind of wood did you use in this build? Oh! One more thing, in the list of tools you noted "Saw". Did you use a Circular or Miter saw for your cuts? Awesome, thank you so much! I intend to start on this in the next couple weeks--I hope it turns out as nice and yours/Austin's. I'd love to hear how it goes and see pictures if you get any! Good luck! Wow Paul! That turned out great! 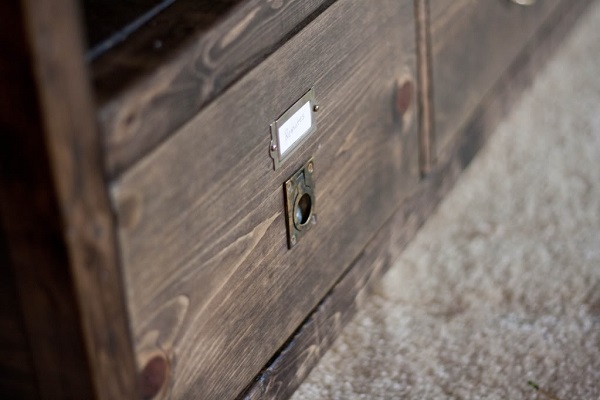 I love that you put two drawers on one side, and the two tone finish is gorgeous. Could I share some of your pictures in the post? Thanks! and yes you are more than welcome to share some of the photos on the post. Nice job!! The table looks amazing!! Thanks for linking up at Romance on a dime!! I'm following you now. Hope to see you link up this Tuesday! I can't wait to try to make this table! I was just wondering where to put the screws? 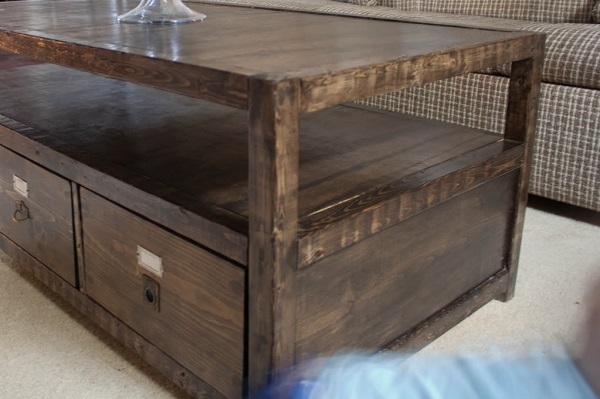 I'm trying to look into the pictures of the finished table for any hints as to where the pieces were screwed together and I can't see any. Also, I've had bad experiences with the wood splitting when using screws on other projects. Do you have any tips I could use so that I can do this table without having the wood split? Maybe pre-drill the holes? Are you talking about the frame? I drilled through the front of the legs into the ends of the side boards, then through the outside edge of the legs into the front/back boards (just be careful not to hit your first screws when you drill the front/back holes). Does that make sense? The reason you can see the screws is because we used a countersink bit to sink them in (http://www.amazon.com/gp/product/B0000225OW/ref=as_li_ss_tl?ie=UTF8&camp=1789&creative=390957&creativeASIN=B0000225OW&linkCode=as2&tag=moliho-20) then filled the holes with a stainable wood filler. When we stained the table the filler made the holes blend right in! love this! I really should have mentioned you in my Ana White tribute post... you're right up there with her as far as I'm concerned :) thanks for all the wonderful posts! In the directions it says to leave 7 1/4" between the bottom and center rails. However in the pictures it shows a 7 1/2" gap. Just wondering if this could be clarified? Thanks!! It does not appear to be fixed in the text. Your plans look great. 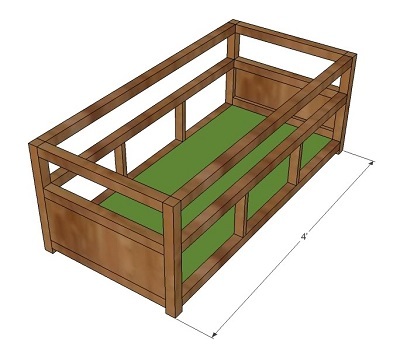 I am looking to start this project but I'm having problems finding 2x2 pine. You also mention "project plywood" above in an earlier post. Where were you able to get these items? I love that table! I was wondering where you were able to find those drawer pulls - you mentioned that you ordered them, but I have been unable to find them anywhere. Also, what do you do to antique the brass? The table looks great! 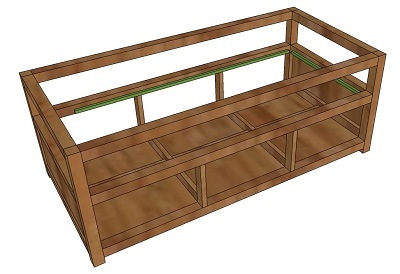 I'm planning on building a version of this after Christmas (I'm hoping to get my own tools). The question I have for you is how well the plywood held up without any cross support underneath it. Was there much (if any) deflection on either surface? That was something I was worried about! But so far we haven't had any deflection at all. I can't say whether it will with more time, but so far it's holding up great! I am a little confused, I bought and cut all of my materials already however I am stuck on step 1 haha. You called for two (N) pieces, yet in step one you say to put one on top edge of c and one on the bottom edge of C.Does this only go on one side panel or both meaning I need 4 (N) Pieces? I have completely struck out looking for drawer slides of the right length for these drawers. Any info on where I might find some? We had to do some hunting, and finally found a Menards that carries them. Otherwise you could order them online, here are a few options. And there are lots more if you google it. Hope this helps! Your legs is 2" wide, stiles at 1" wide and 14 1/2 gap in between. That would be 2x(2") + 2x(1") + 3x(14 1/2") which is 49 1/2 inches total which is 1 1/2 inch over the actual 4' dimension. Am I getting my math wrong? Or there is an error on the drawing. I have just finished this and it turned out very nice. I made an alteration so I could have a concealed keyboard drawer attached (as our TV viewing consists of Netflix, etc). Also masked the keyboard drawer with a flushed wooden piece and matched it around the table for uniformity. Hi- my dad and I just finished building the table last night and we are ready to sand and stain! I am so excited to see how the table turns out. Thanks so much for the plans!!! Now I want to build the end tables to match!! I would love to send you pictures when it's done. That would be wonderful! I love to see finished projects. :) You could email them to me at morelikehome (at) gmail (d0t) com. I would love to include your table in my post if you don't mind. Thanks for the plans! I will be back when i get it finished. Just as a heads up for anyone else building it, I found my lumber costs to be significantly higher than $60. Mine totaled up to $165.33 just for lumber. Still a great deal over retail and I personally love making it myself. Thanks for sharing! I wonder if wood has gone up that much, we built ours almost seven years ago. Or I could have done the math wrong. ;) Anyway, thanks for letting me know! I made a note up in the plans. And I'd love to see your table when you're finished! hi, i am making this table for my year 10 Major Work. 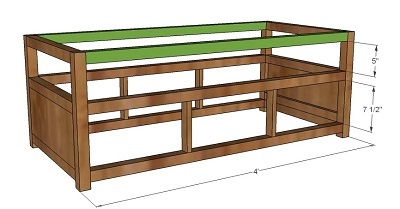 it is a very good design, but i am making a few adjustments such as an overhang for the tabletop, and better support for the drawers. awesome job and look forward to reading more plans! the problem is the drawers are around 10" and all slides now are 12" or more. The part below can be cut to what ever is needed. Oh, thank you so much for commenting! I had found them at Menards in the past, but it's been a couple years. I didn't realize they aren't made that way anymore! Thanks for the tip! I saw this and can't wait to start working on it!! What size drawer slides did you use? I have seen some at 8" and 9" on Amazon and did you use side or bottom mount with these plans? 9" would be great. The drawer is sized for side-mount slides (I've never used bottom mount so I don't know if there would be enough space under the drawer to fit them?). Good luck, can't wait to hear how it turns out! Did the lumber really only cost you $60? i am pricing this out and I am coming in a little over $100? Still most likely going to make the table, was just curious? how long did this project take. in hours if possible, thanks. Sorry, I'm not really sure in hours. We got it built in one weekend, but I'm not sure how long we worked each day. It took us about a week to finish it completely, though, with the sanding, staining, and sealing (we did a one coat per night). So glad I found your site because this is not the table on Anna White's site. I like this table. I do like the chalk paint job she did on Joy In Our Home but I don't see any credit to you. She really takes a lot of credit for the table. 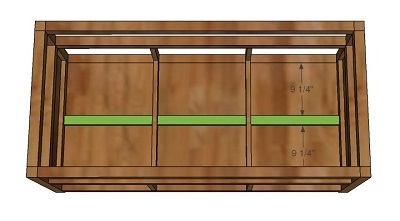 We have been building a large bar room in our house and I will be building that table with the labels. It is just too cool. Thank you so much for the cut list and plans. Georgia and Husband ROCK! Please, can you give me dimensions in centimeters. Hi there. Just a quick question. I finished my table this weekend and was wondering if you put some sort of clear coat on it? Thanks? Step 10 says the drawers are 13.25 wide to allow a 0.5 gap for the slider, but step 3 says the gap for the sliders is 14.5. What is going on? That is an excellent question. I must have drawn the drawers wrong, they should be 13.5" wide then. Sorry about that! I don't see why not? I don't have any experience with dowell pins, but if you have the equipment for it I think it would work! Hmmm... you guys all realize you are doing this as hobbies, right? I spent 40 years owning furniture manufacturing companies and producing 100's of millions of dollars of casegoods, wood products. Bedroom, dining room and occasional tables. We bought wood in 100 truckload lots, at a fraction of the cost you will pay at the lumber yard. We would build this cocktail table with just 2.25 hours of labor. We could apply the finish that we bought in 55 gallon barrels, at a fraction of the cost of what you pay for a quart of finish. At the end of this very time consuming project in your garage... your material costs will exceed what you could buy this table for from a furniture store. If you allocated $10 per hour to your total time invested in completing this table in your garage... it will cost you double or triple what you can buy for online... after delivery cost. You're welcome! Your table is beautiful! This "plan" is very misleading and has multiple errors and omissions. 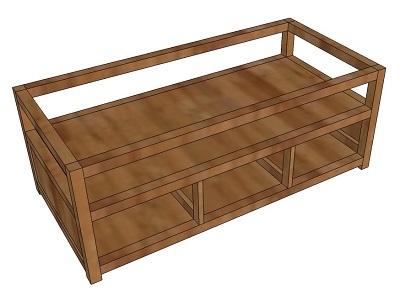 Note that the Author states she hasn't actually built this table, but one similar to it. The drawer slides she mentions in this plan don't actually exist and there is no such thing as a standard 9.5" drawer slide. If you're thinking of building a DIY table, move along. This one will just cause headaches. Hi! Sorry that you are having trouble with the plans. A 9" full-extension drawer slide would do the trick and is available on Amazon (http://amzn.to/2trwURf). 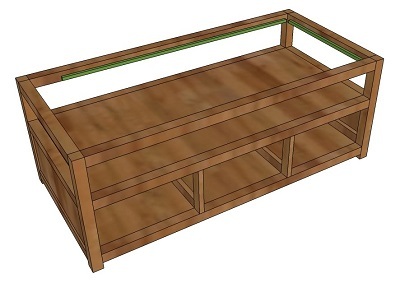 Or if you prefer to skip drawer slides all together you can go back and reference the original table plans (http://www.morelikehome.net/2010/05/lets-build-coffee-table.html) which are the actual plans I used for my table. 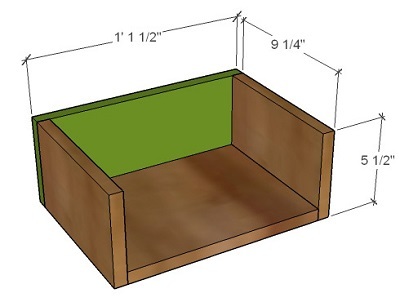 I made these updated plans specifically to accommodate drawer slides in case someone wanted them, and to update the drawings to hopefully be a little easier to follow. Which sounds like it may not have worked. ;) Hope that helps. I ordered a pair of those slides, to give you the benefit of the doubt. Long story short, I shouldn't have. The slides you sent, albeit, 9" long. Do not possess the required thickness to attach to both the drawer, and the inside of the table. You will be left with a 1/2" gap. Again, your measurements don't line up. This is because you do not know how to properly make dimensions in Sketch Up. A simple drafting course will explain how you are supposed to lay out dimensions to allow for recreation. This plan has been nothing but a headache if you actually follow the steps 100%. I'm assuming everyone else on here made adjustments as they saw fit. 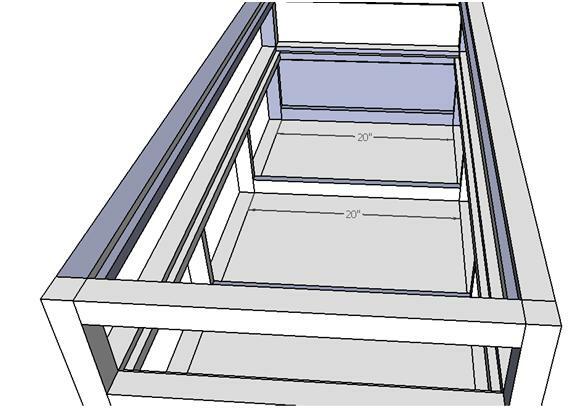 I am now left with a skeleton of a table that does not match standard draw slide measurements, so to find the proper one to fit the 6 drawers I've already cut and paid for, I now have to search the internet for slides that don't exist. Or make my own. Or rip out the entire bottom of the table and build it to standards used in furniture building. I built this with my father, who own a custom home construction company and has been an avid woodworker for well over 40 years. He thought the plans were terrible. Long story short, if you like this table, guy buy one that's similar. 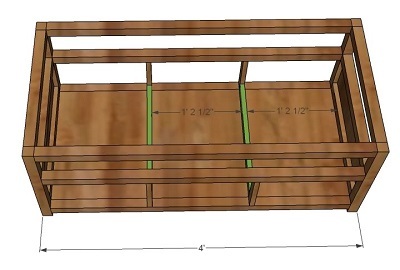 It will be built with much better lumber (Home Depot and Lowe's have terrible lumber options), the construction will done with industry standard techniques and joinery, AND they come with lifetime warranties as long as you don't cheap out and go to a knock off store. 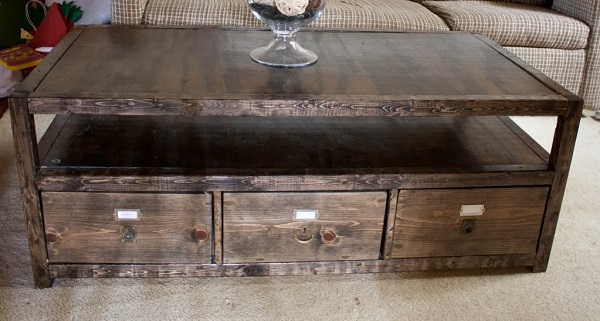 Last but not least; Half Finished Coffee Table for Sale. Finish and use, or great for firewood! If you and your father couldn't make it work by improvising as you go, maybe you should sell your tools, like the guy below. Seriously, who just orders something without researching and seeing if it would work prior to? And industry standard techniques and joinery, really? You clearly are trying to act like you know what your talking about because, supposedly, your father owns some construction company. In regards to the lumber, you're the one buying it! Lifetime warranties, really? If you're worth your salt and something happens to it, put down the video game controller and just fix it yourself or build another one. I hate when people come on sites like this and criticize the OP. It says “built this with my father.” Not “tried to build this.” Maybe you should learn to read before you try to criticize someone’s opinion. Look at you, but internet tough guy coming onto a page just to comment. Did you even attempt this project? Are you even here for DIY? Or to stroke your keyboard hard-on? You’re telling him to put down a controller when your mother clearly needs to take away your keyboard. The last line says "half finished coffee table"...I don't think they completed the project. These plans are so poorly written. 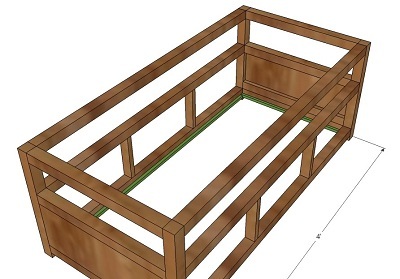 Good plans show you the sheet of plywood and how the cuts should be laid out. Who puts measurements as 1' 11"? Why wouldn't you put 23"? You don't show different angles of each piece to see how things should be attached. You don't show where screws go. I can follow along since I have built several diy pieces of furniture but its taking a lot of extra time to figure out what you are trying to do. Now i'm concerned the drawer slides don't exist so i'm reluctant to start the project. You should hire someone to revise the drawings and instructions so they make more sense. I am a professional drafter. 1’-11” dimension is the correct industry standard. For a non professional drafter, these plans are very clear. An experienced DIY builder should have little problem with them. Good grief man...if you need someone to show you exactly where to put each individual screw, maybe it's time to just sell your tools, and go buy your furniture, instead of coming on here criticizing her plans. Thank you for the idea! I built this for my mother because she was in dire need of a new coffee table. I’d like to send you a picture of my finish product, but I’m not sure how to send it. Thanks for the plans! I used this table as my first wood project. I made some modifications but love how it turned out. The plans definitely helped. I used solid blue pine, would love to kick you some pics if I can figure out how to add to my google account. 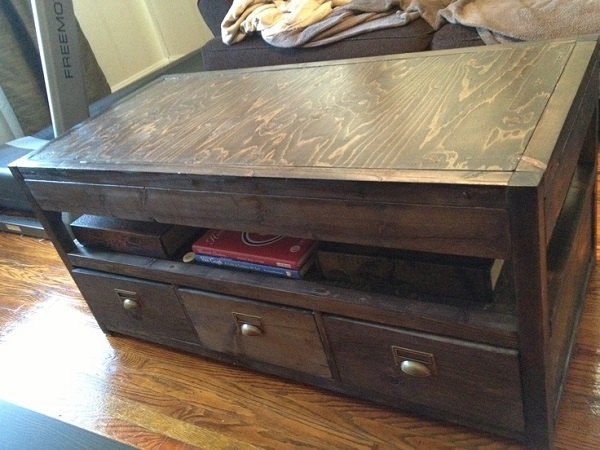 I like the look of this coffee table but the instructions do not mention the RIP size of the 1/2" plywood that you use. You mention buying a sheet of plywood but do not give the dimensions of the cut pieces. 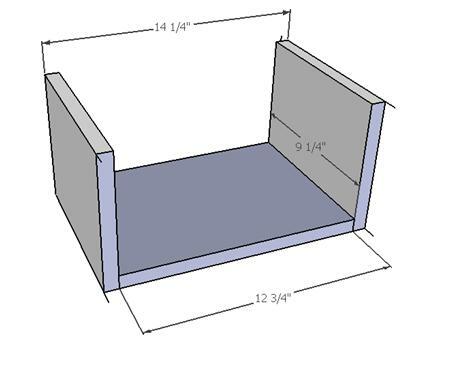 I was able to figure out the dimensions by calculating the total length and width of the coffee table and then reducing the length and width by the 4 sides but I would make the suggestion of placing the exact measurements in your "Cut List" section as it would really help. I came up with needing 3 pieces cut at 3'8" (L) x 1'7" (W) and it worked for me. Just FYI on something that seems to have been left out by mistake. The 2x2s used for the side pieces are actually 1.5 x 1.5" so each shelf is only 3" smaller than the overall length and width of the table. hello. 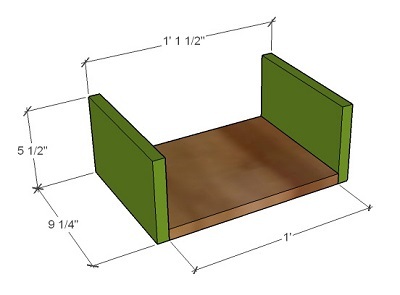 Does anybody have a sketchup file made for this table? Thanks so much. I was able to build it and everyone who knows me is really shocked. This is the first thing I've ever attempted to build and I aced it. I also learned how to use the Kreg jig without destroying anything. Thanks again!! !